Each Spring the Maitland Birds of Prey Center holds its annual Maitland Baby Owl Shower to raise funds to offset the increased costs during baby season. Join them to help celebrate Mother’s Day and spring. Non-releasable baby raptors will be available to view. Other organizations will be joining them on that day for educational activities and programs. Admission is “free” that day with an item suitable that would be used in caring for these young raptors. The list is long, and includes items such as laumdry detergent, duct tape, king size flat sheets, paper towels, toilet paperwild bird seed, trash bags, etc…. Go to website for a complete list. Spring is coming and with it brings baby bird season. During “baby season,” as the Center calls it, the clinic receives approximately 20% of their annual patient load. Most of these young birds have been temporarily displaced from their nests. The Center’s ultimate goal is to get all these babies back into the wild where they belong, and your help is needed! Many of these babies will be reunited with their families or placed in foster nests. Others that are orphaned or that cannot be returned with their families are being raised and prepared for life in the wild. The Birds of Prey Center staff spends many hours educating the public on what to do if they find a baby bird and if the bird is in need of help. The best procedure is to get the baby back up into the nest with its parents if at all possible. I am sharing a portion of this wonderful resource from our fabulous Audubon Birds of Prey Center. It is just 1/2 mile from us here at Thurston House. Many guests have loved visiting and learning about these magnificient birds. Welcome to Florida Raptor News! The Raptor News eNewsletter is an easy way is to stay up to date on activities, programs and events with the incredible Audubon Center for Birds of Prey in Maitland. We invite you to share with other friends, birders and conservationists the exciting events and opportunities going on at one of Florida’s best-kept secrets. Please enjoy the following notes about the recent happenings at our wonderful Center. Also, you can always stay up to date on upcoming programs and activities by visiting our Facebook Page. Join the community! Thanks and see you at the Center! As the Bird care team prepares for upcoming baby season, so do some of our resident raptors. Several of our permanent residents assist as foster parents during this critical time. Athena, an Eastern Screech-Owl was brought to Audubon from Suncoast Seabird Sanctuary in February 2013 when they could no longer care for her. She was admitted to Suncoast with a fractured right wing and a dislocated left wing. They had used her as a foster parent for orphaned Eastern Screech owlets, and we have continued to employ her skills as a parent. This year we have designed a whole new cage for Athena to raise her little orphans in a safe environment where they will have less human contact and more uninterrupted time with their new “Mom”. We are all excited to see how Athena likes her new parenting mew. As spring arrives, be cautious about tree trimming. Many of Central Florida’s cavity nesters may be using your trees as a safe home. Consider trimming during alternate months not during nesting season; be aware of cavity nesting birds such as Eastern Screech owls. Birds breakfast Thurston House B&B, both things guests love about us. The City of Maitland is honored to fall directly within the Great Florida Birding Trail – East. Signs around the city show visitors the way to the fabulous Audubon Birds of Prey Center. This facility happens to be only 2 streets from our Central Florida Bed & Breakfast Thurston House. 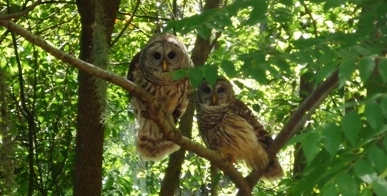 Wander around and view the many varieties of birds, from owls and kestrels to the elegant bald eagles, osprey and hawks. This amazing place is the permenant home to several birds that cannot be released back into the wild. “Trouble” is one of these birds, a bald eagle that was too injured to be rehabilitated enough to be on its’ own. After your visit to the center, relax on our wraparound porch and enjoy what we like to refer to as our “mini-Audubon Center”. Ducks, anhinga’s, and osprey enjoy Lake Eulalia’s offerings. 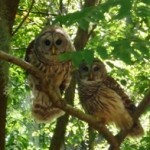 Owls hoot from the woods and occasionally will swoop down to show off for guests. Egrets and herons find their way along our shores too, elegant with their long necks and legs. Smaller birds such as hummingbirds, titmouse, thrashers, blackbirds and cardinals are constant visitors, and love to fly among the bushes and trees, serenading as they go. Enjoy our new website page, dedicated just for our Feathered Friends, and look for new photos to be added regularily.